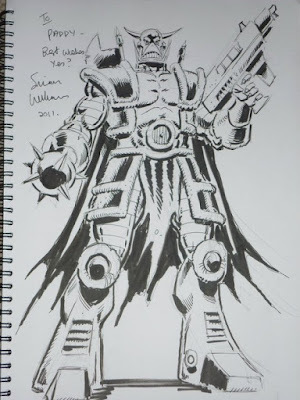 Simon Williams Comic Artist: Newsarama interview, yes? Check out this Newsarama interview with Simon Furman and yours truly... where we talk about the upcoming Incredible Hulk/Death's Head story which will appear in the upcoming issue of Marvel Heroes (issue 33... available March 24th from all good UK Newsagents). It's great that this strip is making news... fan feedback has literally been incredible, and I want to thank everyone for all the kind words and support. At this past weekends Cardiff International Comic Expo (which I will discuss in an upcoming post), Death's Head was shown a LOT of love... I spent most of the day drawing sketches of the freelance peacekeeping agent for fans! Cardiff Comic Expo for my good friend Patrick Montgomery. Death's Head is back, yes?